Before Jeff Weiner took the top spot at LinkedIn, he asked founder and then-CEO Reid Hoffman three questions: “How do you want to handle decision-making? What decisions would you like to make, and what decisions should I be making?” Hoffman responded: “That’s easy. It’s your ball, you run with it.” A simple exchange, perhaps, but it kicked off one of the most successful CEO transitions in Silicon Valley history. Hoffman knew that to make it work, a company needs to give its leader clear and singular decision-making power over the day-to-day, and he was right. Weiner led LinkedIn through a blockbuster IPO to a current market capitalization of over $20 billion. After the IPO, he’s come out the other side with several incredible management lessons. 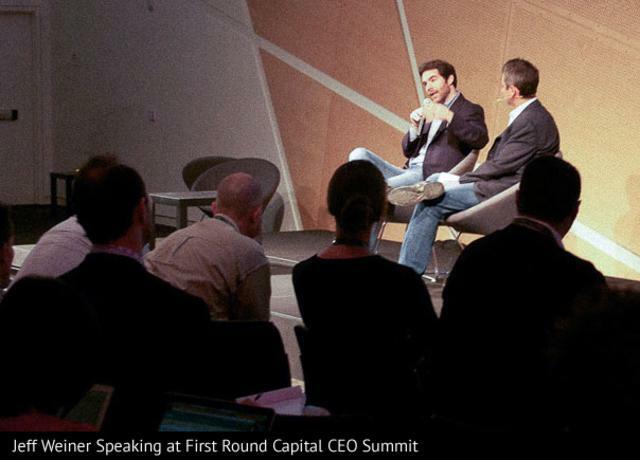 Below are some of the thoughts he shared at the last First Round Capital CEO Summit. Most startups begin with a kernel of an idea and a lot of passion. This one idea is what the founding team knows and loves. It’s what keeps them working all day and up at night. But if this small early team doesn’t lay the right foundation — a combination of the right tools, people and protocols — their idea won’t scale, and they won’t be able to deliver on their vision. It happens all the time. Vision is the dream. A company’s true north. It’s what inspires everyone day in and day out. It’s what you constantly need to be aspiring to. Weiner believes getting your “boat” to the best possible destination requires a clearly-articulated vision and mission. These statements ultimately inform and invigorate a company’s strategy and objectives. Perhaps most importantly, leaders need to talk the talk and walk the walk on their professed values to keep the entire company unified and moving in the right direction. That’s all nice to say — but how does a CEO enact these ideals? Too often, company values are relegated to posters on walls or preachy all-hands meetings. But Weiner believes a good leader can bring them to life — through coaching, a strategy designed to achieve the mission as it’s outlined, clear objectives and measured, communicated results. “Vision is the dream,” says Weiner. “A company’s true north. It’s what inspires everyone day in and day out. It’s what you constantly need to be aspiring to.” He defines LinkedIn’s vision as “Creating economic opportunity for every professional," where 'professional' refers to every single one of the over 3.3 billion people in the global workforce. OKRs should definitely not be is easily achievable. Low expectations may seem to yield glowing results, but they eventually stall people, teams and companies in the long run. OKRs shouldn’t be too malleable either. They’re supposed to be quarterly beacons, not shifting from week to week. Along these lines, Weiner prefers that his team members set three to five OKRs for themselves in any given quarter. Anything more than that has the potential to distract from what really needs to get done. The weekly meeting is all about general tactical updates, how everyone’s doing on their OKRs, any big changes to plan, etc. It’s definitely not a rehash on everyone’s laundry list of activities. Instead, it’s meant to provide a high level view of what everyone is doing and to ensure that they’re all operating against the same goals and principles. On top of this, Weiner blocks out an hour on both Monday and Friday for strategic deep dives if needed. By separating out tactics from strategy, he makes sure the team stays focused and on track without constantly switching between long-term and short-term contexts. In addition to creating time to think proactively, Weiner believes that success for a manager comes from being ‘compassionate’ rather than ‘empathetic.’ Empathy refers to experiencing what another person does as if you were that person. Compassion is understanding what the other person is experiencing, and maintaining enough objective space where you can act accordingly. Weiner draws on the example of a bystander observing a man being crushed by a boulder. An empathetic person will feel the same suffocation and be unable to help. But the compassionate observer can understand victim’s pain while also taking action. The skilled leader’s task is to understand things from another person’s perspective, and use that strength to improve the situation. Incredible IPOs don’t come out of nowhere. Despite all the talk around the Valley and in the media about meaningless valuations and the crazy market, it takes great skill to make it to a public offering at all, much less one that people will remember. The day LinkedIn went public, it made instant headlines after beating analyst and public expectations. People still talk about it.